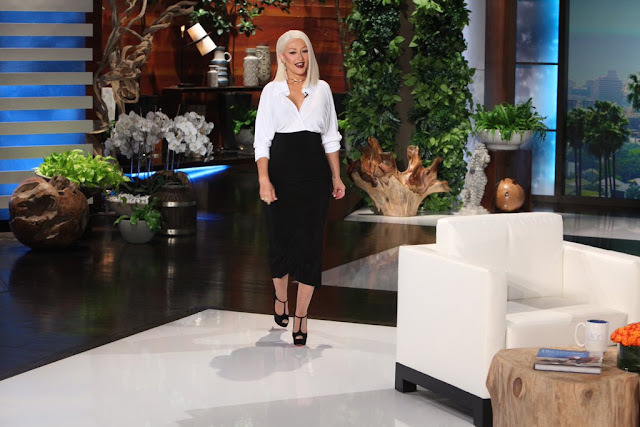 Christina Aguilera (Xtina) is set to make an appearance on The Ellen Show in the next few weeks. Speculation of new music has been surrounding Christina for the past few of months, but it wasn't until recently that an uproar began when a secret performance (taped for "The Voice") had been promoted to be top secret performance that "every Christina Aguilera fan" would enjoy. Naturally, as fans, we hoped for new material since the last time we got new music was 4 years ago ("Lotus"). 📺: @Xtina will be making an appearance on one of our favorite day time talk shows in the near future. More details to come soon. Christina is filming her guest spot on Ellen today! First photo from Christina's appearance on Ellen has finally surfaced. Our girl has been killing it the past week or two with the looks her and her glam squad have been delivering. What are your thoughts on her recent looks? Let us know in the comments below. Our girl dominated "Heads Up" on Ellen. As the names of artists appeared Christina had to sing like the artist, whose name came up, so Ellen could guess it correctly. They scored 8 out of 8. Woohoo!